Miniatures for Roleplaying: Slipstream Miniatures - Robots! Its been a little while since I painted anything new, mainly because I have been waiting for some miniatures to arrive from Reaper and also due to having lots of other things demanding my attention. But the Reaper box arrived this week, with a bill from Customs & Royal Mail for £12.93. I had £25 to spend from a prize in a Reaper painting competition and added a bit to reach the free international shipping threshold so I was a bit annoyed when the Tax Man added on £4.43 (which I can accept) and Royal Mail added £8.00 handling for the paying the Tax Man on my behalf (which is the bit that was annoying). Oh well, lesson learned....buy from the UK stockist for Reaper Miniatures next time. The box from Reaper contained about half Bones plastic miniatures with the remainder being Chronoscope figures for my GM's Slipstream game. The first ones to get some paint were the ones that will represent my character. Thats right, I have multiple figures for my character! SAM-66 is the Rocket Ship's Chief Engineer and Medical Officer, and to help him with his duties he has three Toolbots. I wanted something similar to the Drones from Silent Running or the Floating Robots from The Black Hole and these fitted the bill perfectly. They'll be used to repair the ship and my character if he gets damaged and will add some comic relief too. I wanted my character to look futuristic but not pristine so he has a couple of metal panels that he hasn't gotten around to painting yet but is otherwise clean looking. 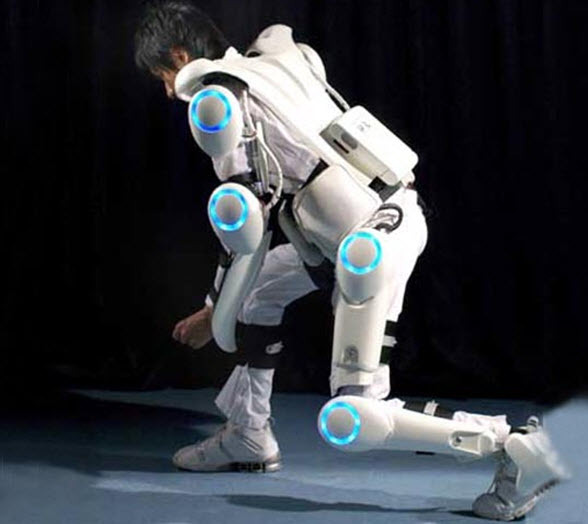 I took inspiration from real world Robotic Assisted Movement suits (for the disabled) and the Honda Asimo robot. I like the shiny white look that seems to be prevalent at the moment with a soft blue accent colour. I hope you like the results, i'm very happy with them myself and I think they came out very well. The social acceptability of gaming. Or not.